A simple festive drink with just three ingredients, this Sparkling Pomegranate Mocktail is perfect for entertaining friends. The secret to success is the mystery garnish! Add a splash of vodka for a holiday happy hour! What’s red, sparkling, and perfect for holidays? Hosting a holiday get together and you’re looking for the best way to spread your dollars, but still impress your guests? Start with a simple and festive drink that’s sure to share your holiday spirit. This Sparkling Pomegranate Mocktail uses only three ingredients for the drink itself, then it’s rimmed with sumac spice for an added flavor that pairs perfectly with the drink. 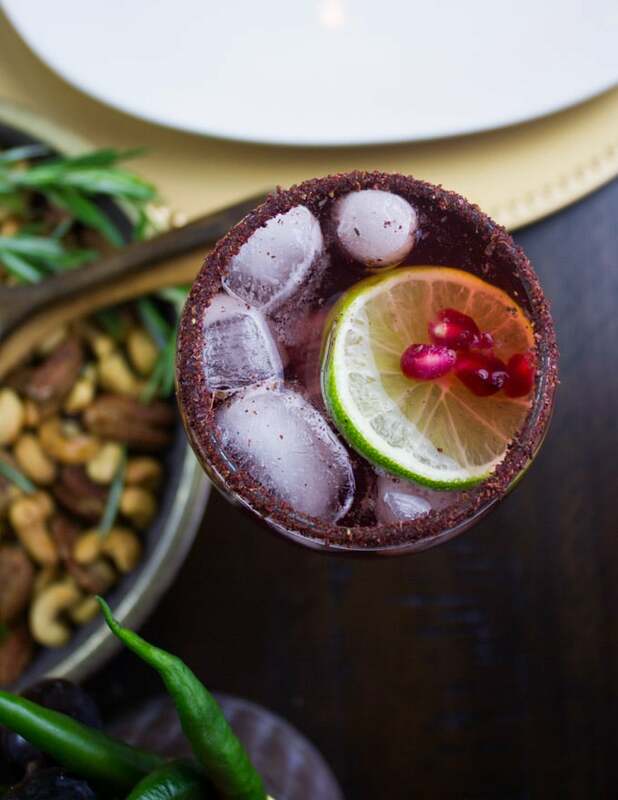 Garnished with lime slices and pomegranate arils, this simple drink can be turned into a delightful vodka-based cocktail for your holiday happy hour! Serve with your favorite appetizers, cheeses, or custom Charcuterie board. Make the mocktails by mixing the juices together and adding in a teaspoon of sumac spice. Place the remaining sumac on a small plate and dip the rims of your cups in water, followed by the sumac spice. Pour the cocktail into the ready glasses and serve with a slice of lime and extra pomegranate arils if you like! Home Chef Tip: For an adults-only version of this drink, add 2 ounces of vodka to each drink. Looking for the perfect pairings for this festive drink? If you’re entertaining, you can’t just serve a drink, no matter how good it is. Whether you’re hosting a full meal or just celebrating a holiday happy hour at home with friends, these recipes are perfect for pairing with your Sparkling Pomegranate Mocktail and they are sure to impress! Want to throw a cheese party? We’ve got you covered with these recipes for Rosemary Spiced Candied Pecans and Cashews, the best homemade Pita Chips, and the most delicious cheddar cheeses! If you’re hosting happy hour at home and you’re in search of an easy recipe, this Herb Mushroom Cheesy Garlic Bread recipe is for you! A 15-minute appetizer or side that’s so simple and impressive! This Roasted Persimmon Burrata Crostini recipe will be the star of the show at your next get together. Roasted persimmon, creamy Burrata cheese, and fresh thyme top crunchy bread for an appetizer that’s irresistible! We know your guests will enjoy these delightful Prosciutto-Wrapped Stuffed Shrimp. Jumbo shrimp are stuffed with a cream cheese mixture, wrapped in prosciutto, and baked to perfection! We hope you enjoy this Sparkling Pomegranate Mocktail recipe from Two Purple Figs as much as we do. If you love this recipe and you’re looking for more like it, visit our Drinks Section. For daily recipe inspiration, subscribe to our newsletter, like us on Facebook, and follow us on Pinterest. Enjoy!